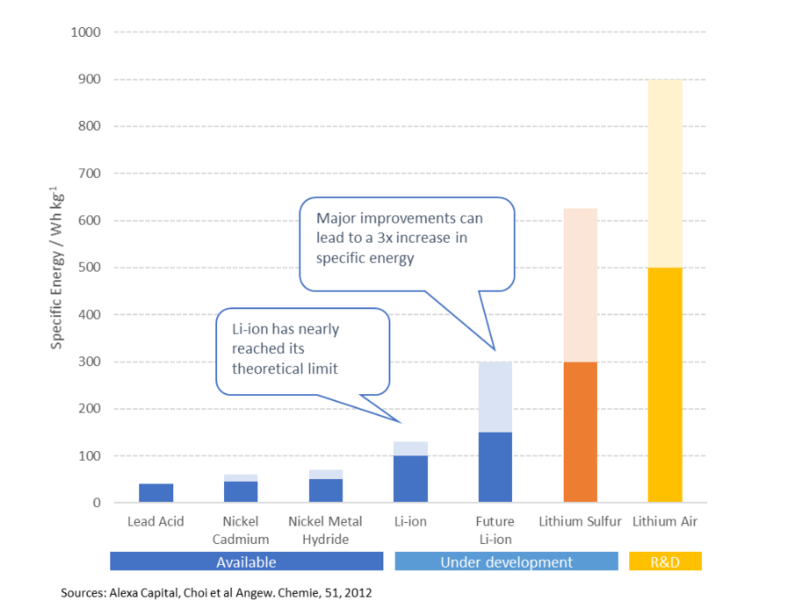 The tremendous advances being made in lithium battery technology are being underestimated by many people, writes financial energy specialist Gerard Reid. Competitive EVs are just a few years away. They will be followed by radical improvements that will have huge implications for air and ship transport as well. Courtesy Energy and Carbon blog. I constantly here from people that batteries are just not good enough; that they are too expensive, that they cannot hold enough energy, that they take too long to charge. In a nutshell, that they can never replace oil to power the automobile or be used alongside solar panels to power our everyday home needs. The interesting thing is that I agree with all these criticisms. However, I am also clear that these challenges will be solved in the coming years thanks to the usage of new chemistries and materials as well as intense competition between battery manufacturers. I am also convinced that better batteries will lead to the electrification of not just cars but also trucks, busses and increasingly air and sea transport. At the same time, we will use these batteries in our homes, businesses and grids as part of decentralized energy systems. And all these batteries will be most likely based around the element lithium. Lithium is quite unique as a material in that it is very light with the lowest reduction potential of any chemical element which allows batteries based on lithium to have unbeatable performance. The other advantage is that there is lots of lithium out there, some 400 years of output according to the US Geological Survey. The most popular type of lithium batttery is the lithium-ion battery which because of its unmatchable combination of higher energy and power density has become the rechargeable battery of choice for power tools, mobile phones, laptops and increasingly electrical vehicles (EVs). That all said, there are many different types of lithium-ion battery. And I don’t mean just different manufacturers such as Panasonic, LG Chem, CATL and Samsung. There are five major types of lithium-ion battery chemistry: LFP (lithium iron phosphate), NMC (nickel manganese cobalt), NCA (nickel cobalt aluminum), LMO (lithium manganese oxide) and LCO (lithium cobalt oxide), all of which have differing strengths and weaknesses, and all of which are used in different applications. NMC, for instance, is generally regarded as the chemistry with the most potential for use in the EV given its high performance, safety and low cost. And in the short term there is significant potential to reduce the cost and improve the performance of NMC batteries. Currently, the standard NMC lithium-ion battery is called a 333 meaning it uses 3 parts nickel, 3 manganese and 3 cobalt. Going forward, we will see 811 NMC batteries which will use more nickel which increases performance and less cobalt which decreases cost. However, none of these lithium-ion chemistries are going to provide the energy and power density required to power an airplane, so the search is on for better materials. One of the most interesting possibilities is to replace the commonly used graphite anode in the lithium-ion battery with cheaper and theoretically 10x more energy dense silicon. Note, I said theoretical as the issue with silicon is that it degrades quickly which means its lifespan is not long. The good news is that are many firms such as Nexeon and Wacker Chemie working on resolving this issue, and in fact it is widely believed that Tesla and Panasonic are already sprinkling silicon on the anode side of their new Model 3 battery. Other technical innovations could involve the replacement of one of the battery’s key components in the battery, the electrolyte which is currently a liquid, with a solid electrolyte which would be safer while also improving energy density. However, these changes will all take time. Moving from the test laboratory to production takes many years. Materials need to be developed, then tested, again and again to ensure that they are safe and have the longevity and other characteristics that customers require. In addition, production processes need to be put in place to ensure that those batteries can be produced cost effectively and at high qualities. Toyota, for instance, has been working for many years on so called solid-state batteries and they are not expecting to bring this technology to the market till 2022! The good news though is that lithium-ion batteries costs are likely to fall another 50% by 2020 to $100/kWh while at the same time energy density should increase by 20% which will help bring the range of the average electric vehicle (EV) towards 500km. At the same time, this should be enough to ensure cost parity with the internal combustion engine (ICE) car which will in turn give the market for EVs a huge boost. And with growing competition particularly between America, Europe, China and Japan driving innovation at breathtaking speeds, it may not be that long before many of the breakthroughs mentioned above come to market. This competition is also likely to push radical new technologies such as lithium-sulphur and lithium-air to the market much quicker than what most people currently expect. Such technologies theoretically can deliver energy densities greater than gasoline can which would have huge implications for not only road travel but also air and ship transport. Now that would make things very interesting! Gerard Reid is founding partner of Alexa Capital in London. Her has over two decades of experience in equity research and fund management in the energy area. He is also a monthly columnist for the German energy industry publication BIZZ energy today and has been lecturer at the university in Berlin for the last decade. This article was first published on Energy and Carbon, a blog hosted by Gerard Reid and energy journalist and advisor Gerard Wynn. It is republished here with permission. The LTO battery has the disadvantage of lower specific energy but the newer battery, the LNTO type, has much higher energy density than standard lithium batteries. This will revolutionize energy technology and is the greatest hope on the planet for averting climate catastrophe. How far along is testing? Toshiba’s SCiB has great cycling (10,000) but apparently does not have enough capacity per kg to be used in EVs. Even a 5,000 cycle life in a 200 mile EV would be a 1 million mile battery. Cost? With the cycle life of the SCiB I’ve wondered why the battery has not been used for grid storage (supply:demand smoothing). Weight and volume are not a large issue for grid use (within reason). 10,000 cycles would mean the ability to move daytime solar into evening hours every day for 27 years. Or solar into evening hours and wind into morning hours every day for over 13 years. What’s the reason why Tesla is not using this technology in its Powerwalls and Powerpacks?